Low Tide/Flying V, 2013. Oil and spray paint on canvas. 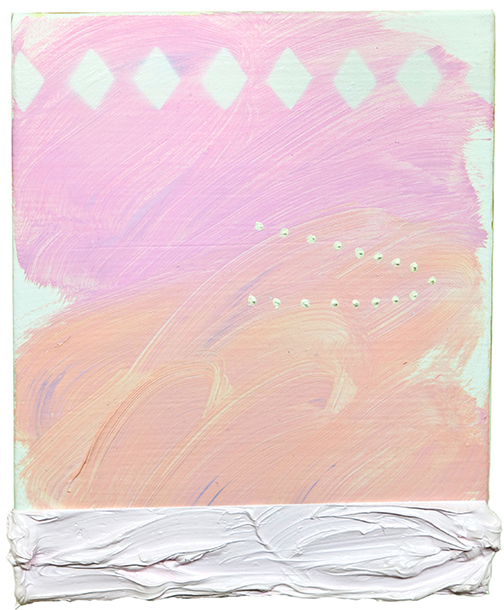 I just finished working on a small group of paintings for a show at John Davis Gallery this June. I make work that hovers between representation and abstraction. Sometimes the scales tilt and it winds up one way or the other. I've been working in 3 series lately. They're titled Joggie, Brooklyn Zoo and Basement Arcade. Joggie was an imaginary friend I had when I was 6 who lived on Jupiter. It's funny looking back, I would be fixated looking out of my window, daydreaming. It's not too far off from what I'm like now (Laughs). These works have a lot of dream-like and cosmic imagery. Brooklyn Zoo is series of paintings that reference growing up on the East Coast in an urban setting. 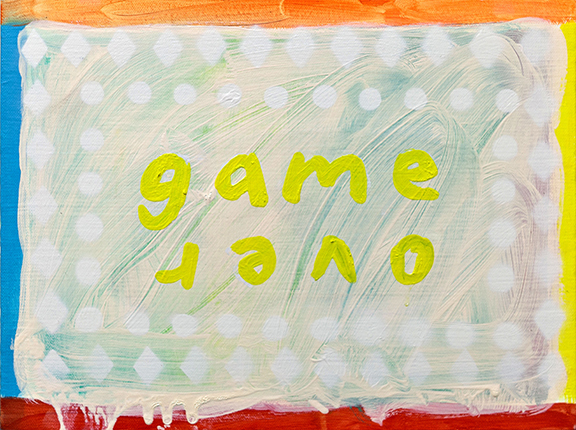 Basketball, hip hop records and food imagery find their way into these paintings. And Basement Arcade is a way to explore patterns via early video game screens. Particularly, when a screen freezes I think it does some strange looking stuff. 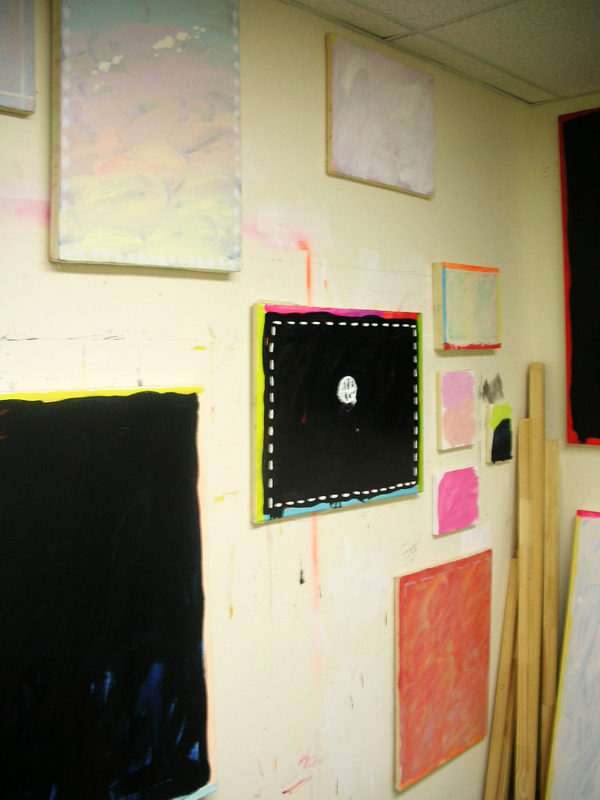 I try to work in the studio about 3 or 4 nights a week. When I first get there I try to fool myself into working - sweeping the floor, looking at pictures, eating some food. Before I actually make a painting I'll look at images in photoshop and make studies. It's dawned on me that this is where a lot of the actual "work" goes on. Once I'm ready, I start about 3-4 paintings at once. And it takes about a month or so to finish that for me. I'm actually moving studios. I'm about to have more space, which I'm really excited about. Small spaces often force you to work small. My current space isn't too big, arranged with supplies in the middle of the room and then works on the surrounding walls. My floors and walls get really messy. Sometimes I write things on the wall so I can remember: what color something should be, what I need from the store or a title. It comes from anywhere. I just pick up on things around me - the feeling of a neighbourhood, places, things or people that mean something to me. I like to let intuition guide what I'm doing. Sometimes I'll be watching a movie or I'll read a line in a book that resonates with me on a personal level. From there I kind of obsess over that thing, whatever it may be. Then I want to paint. But, the painting is always something else. The painting is about describing an abstraction - space, atmosphere and sensation. My work flirts with the decorative and nostalgic. I love patterns and sensual handling of paint. I'm not afraid of these things or their implications. But, I have a tendency to be attracted to overly sweet ideas/images. And in a painting, sentimentality is the easiest affect to conjure. Knowing when a painting is just pretty enough, but not overtly pretty can be tough. 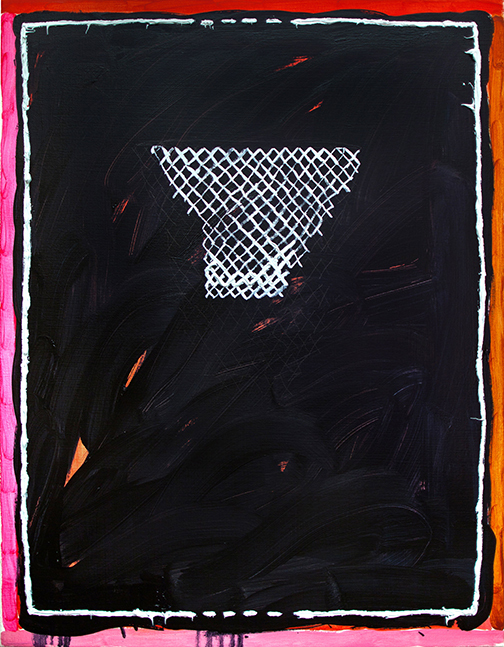 Nothing But Net, 2013. Oil on canvas. I like to experiment with different mediums. I paint on canvas. I use oil, acrylic, spray paint, glitter and enamel. I like when my surfaces are varied and almost constructed. This is a tough question. As a painter, you always want to set up parameters that don't allow you to get bored. One of the things I'm interested in is contradiction. It seemed like the first half of the 20th century was about keeping metaphysics in painting - nothingness, mystery, sublime, existentialism etc. Then the second half came along and threw it out. I'm interested in creating an ambiguous space in a painting - shallow depth, physicality of texture and a touch and go sense of reality. This allows me to play. Which is really what I want to do the most. Begin, 2013. Oil and spray paint on canvas.